Ah Facebook…always looking for new/better ways to be transparent and to protect our security. That’s why they’ve implemented this…oh, sorry, that’s not it–that’s just the billionth time they “accidentally” changed users’ sharing settings to public. Last week. But they’re sorry, obvi, because they a whole commercial promising that they’re going to do better to protect our privacy and keep us safe. No, but seriously–this time they mean it, and to prove it, they announced on May 24 that they’re proving their commitment to transparency by “shining a light on ads with political content. Under this new program, any Facebook Page paying to promote political content will have to follow the newly-minted rules for ads with political content. This will be accomplished by forcing the admins of pages running what Facebook is classifying as political ads to complete an authorization process; promoted posts/ads will display a “paid for by” disclosure, and such ads will also be archived for up to seven years in a publicly searchable database. Values? Health? Education? Civil Rights? Facebook began enforcing these new rules on May 24, via a “machine learning classifier” that scans all promoted content for identifiers of political- or issue-related material. If the bot deems the content to be political, it checks three things: if the person placing the ad has been authorized to buy ads with political content? Is the ad account linked to a Page with an admin who has completed the authorization process and been approved authorized to place ads with political content? And when creating the ad or boosting the post, did the advertiser check the box stating “This ad includes political content”? If all three things aren’t ok, the ad will be rejected. Oh, and also, the classifier is looking at the terms used in ad copy and the landing page, regardless of who the advertiser is, per the Center for Cooperative Media. It’s not just the ad content that Facebook is looking at; they’re reviewing any page you link to for political content. 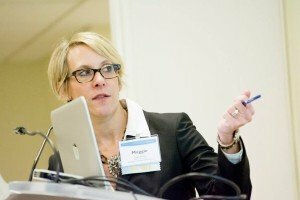 So the first snag for associations and nonprofits is the authorization process. Any admin who will be running political ads has to provide Facebook with their US driver’s license or US passport, residential mailing address and the last 4 digits of their Social Security number. So yes, that means that I or anyone else managing a Facebook page that plans to pay to run ads or promote posts has to provide ALL OF THIS INFO TO FACEBOOK, the same platform that never seems to stop making headlines for sharing user data and privacy breaches. And yes, I did say “anyone managing a Facebook page that plans to pay to run ads or promote posts” because even though these rules are meant to provide transparency around political ads, remember those national legislative issue of public importance, e.g. education, health, poverty, civil rights, etc? Any/all of those terms or variations of them will be–and are already being– flagged by Facebook and those pages won’t be allowed to pay to play unless their page’s admin has been authorized. Oh, and also–say you work for an association and your page’s admin has handed over all information necessary to allow someone to steal their identity in the event that data is ever breached–but when that admin wants to run an ad or promote a post that has nothing to do with politics doesn’t check the box stating “this ad includes political content”….that ad will likely be rejected (see above). And here’s the archive to date of association content being labeled by FB as political because it includes the word “health”. 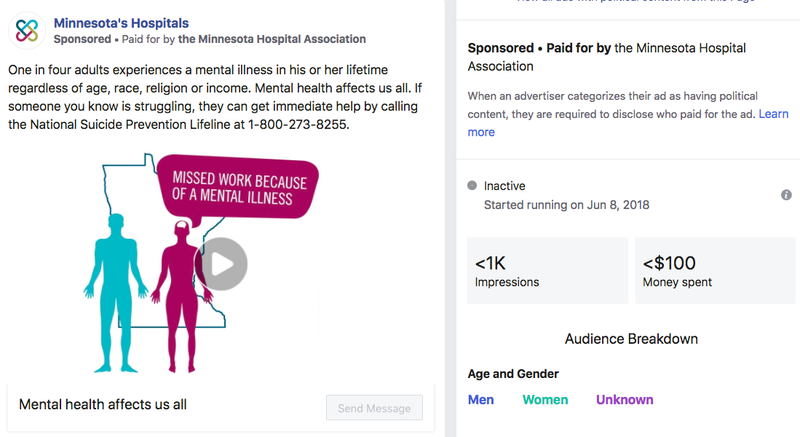 So for the Minnesota Hospital Association post above–that’s just giving the number for the National Suicide Prevention Lifeline–indicates, as presumably any association post touching on any of the issues listed above, that the association checked a box indicating that the ad has political content. What happens when 501(c)(3)s that pay to promote every post–because that’s pretty much the only way you get any reach on Facebook these days–start being flagged by the IRS for exceeding the expenditure test and lose their nonprofit status? After all, the Catch 22 is now in effect that basically mandates that issue-focused organizations check box indicating that every paid post is a political ad or risk your ad–and all future ads that don’t include the political check box checked–being rejected. Should they not run any FB ads because this applies not only to content in the promoted post/ad, but also on the landing page. Associations aren’t the only ones up in arms about this new system; news groups have asked Facebook to exclude quality journalistic content from classification as political advertising. If you manage a Facebook page or ads for an association or nonprofit’s Facebook page, have you run into this issue yet? If not, have you either already completed the authorization process or do you plan to? It’s one more nail in the coffin for Facebook. They’re so twisted into a knot they don’t know what to do. Facebook as an audience engagement channel has been next to worthless for a long time, anyway – unless you’re willing to expand Zuckerberg’s bank account. I think that so many people think they’re too big to fail, and point to the fact that their valuation/revenue is up in spite of all the recent stuff as proof of that. However, I think the bloom is off the rose and more people are starting to realize that they’ve been pouring trust and ad dollars into FB based on empty promises, and are starting to re-think.